After enjoying a bumper crop of lychees two years ago, when farmers were practically giving them away, we thought last year’s crops were anemic. We figured it was just an off year, but this year’s lychee crop was even more pitiful. Same for lilikoi (passionfruit). We’ve learned recently though about an invasive species on Kaua’i that’s been attacking crops all over the island – the pretty little rose-ringed parakeet! These little birds now numbers in the thousands and are causing environmental and economic damage all around the Garden Island. Normally not considered a nuisance bird, the parakeet population on Kaua’i has exploded in the past few years, becoming more than just a nuisance to farmers, gardeners and others in the neighborhoods where they roost. Kaua’i is not alone either – they’re also causing problems on Oahu. 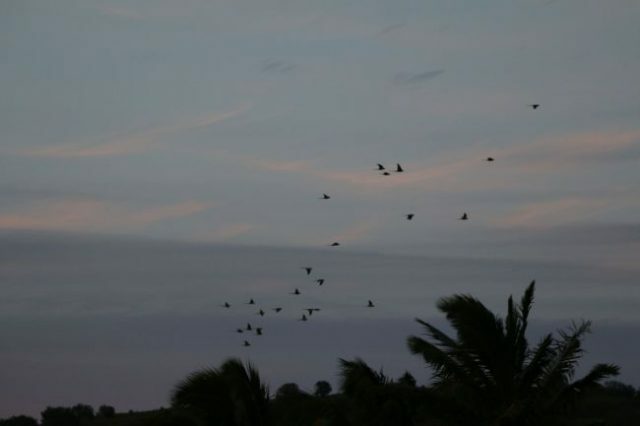 A flock of parakeets flies over the island at dusk. The parakeet population is estimated to be around 5,000 on Kaua’i, and is growing exponentially. Believe it or not, the current horde started when two of the pretty birds were imported to the island by the owner of a B&B in Lawai, on the south side of the island, and escaped into the wild in 1968 and started a family. They’ve been a “slow invader,” and up until recently the birds were considered an entertaining novelty, especially when the bright green flocks would swoop into the trees at dusk. In the past couple of years however the population has reached what is called “critical mass” and unless steps are taken the number of parakeets will continue to expand at an increasingly faster and faster rate. All these parakeets need to eat, and they have been going after fruit crops around the island with a vengeance, particularly lychee and longan trees. However, no fruit is safe from them. Although the birds are small, a flock of them, armed with their sharp, hooked beaks, can strip a large fruit tree in a day or overnight, whether that’s lychees or tangerines or bananas. They have also gone after the seed corn crops grown on the west side, and have been eating unripe lilikoi on the vine, damaging that crop. They primarily tend to flock at the tops of trees though, and besides eating the best fruit at the top they defecate on fruit below, contaminating it so that it’s unable to be sold or eaten. It’s the same for other fruits and vegetables in any area where they flock. Farmers have reported losing as much as a 30% of their fruit crops last year because of the parakeets. The birds have also become a nuisance to condo and home owners. Once thought to be pretty, intelligent and interesting, the increasingly larger flocks of parakeets leave a mess in their wake, sometimes covering an entire property in droppings overnight. The flocks can also be incredibly noisy. The parakeets also have the potential to cause disturbing environmental damage. For now they are eating and roosting in the island lowlands, but as their population grows it’s feared they will begin moving to higher elevations, driving out native species of birds and other animals. 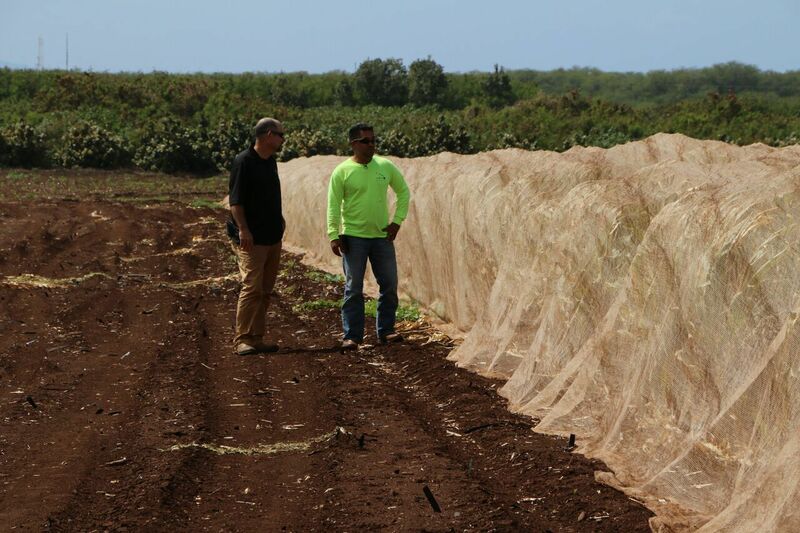 Kaua’i farmers are having to cover crops with netting to protect them from the marauding parakeets. Farmers have tried to protect their crops but their efforts have either been ineffective against the parakeet hoards, or cumbersome and difficult, such as covering trees or plants with netting. Condo owners have butchered palm trees in an effort to keep the parakeet swarms away from their property. 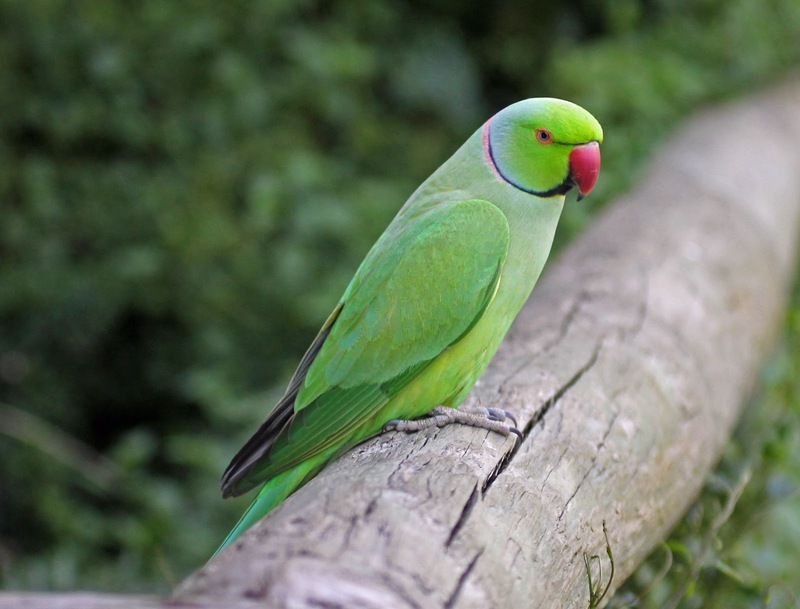 The rose-ringed parakeet has been labeled as an invasive species, and farmers and other stakeholders are now collaborating with county, state and federal agencies to try to stop their spread. The fear is that left unchecked, the parakeet population on Kaua’i could reach 10,000 in the next five years, causing widespread crop destruction as well as other economic and environmental disasters. I first heard about the parakeets from other residents shortly after we arrived, but until recently had never seen them. I’ve now seen flocks roost in the palm trees across the way several times, although they don’t stay for long – they’re apparently on their way to somewhere else. They are pretty to look at, and I hope a solution can be found soon that protects both the birds and farmers. Once an invasive species gets established, the only choice becomes to eliminate them and here in Florida that has not been too successful. ie Lion fish, pythons, gila lizards etc. There are not a lot of choices here about what to do about the parakeets. Nobody really wants to see them killed, and yet that’s what it might come to. One solution that’s been brought up is capturing the birds and sterilizing the males. It takes some time but eventually the size of the flock can be controlled. Wow, hard to imagine that something so beautiful could cause so much destruction. I hope there is a humane solution. Introduced species can wreak havoc in an island ecosystem like Hawaii. In my area (Manhattan Beach, CA), we have multiple colonies of parrots called green-mitred conures. Supposedly they are descendants of pet shop escapees from the 1980s. They are very noisy, flying around in flocks and hanging out in the palm trees in the neighborhood, squawking away. But I like them because they are colorful and kind of unexpected. They remind me of “The Wild Parrots of Telegraph Hill” book and documentary. Any invasive species can destroy an ecosystem, but Hawai’i is unique because of its isolation. I honestly have no idea how or if a solution will be found outside of outright destruction, which no one wants. I’ve read arguments that the animals should take precedence over the farmers, but in most cases the farmers were here long before the parakeets.